Heather Dubreuil works in fibre art, creating unique cityscapes with hand-dyed cloth and machine stitching. 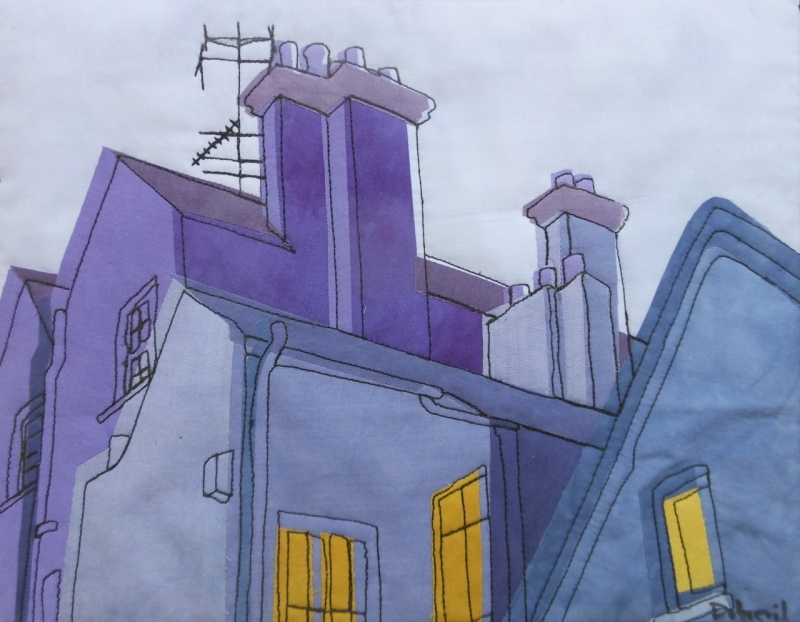 Her work contrasts the hard stone buildings with the soft cloth of her pieces and she adds an extra dimension with unexpected colour selection. 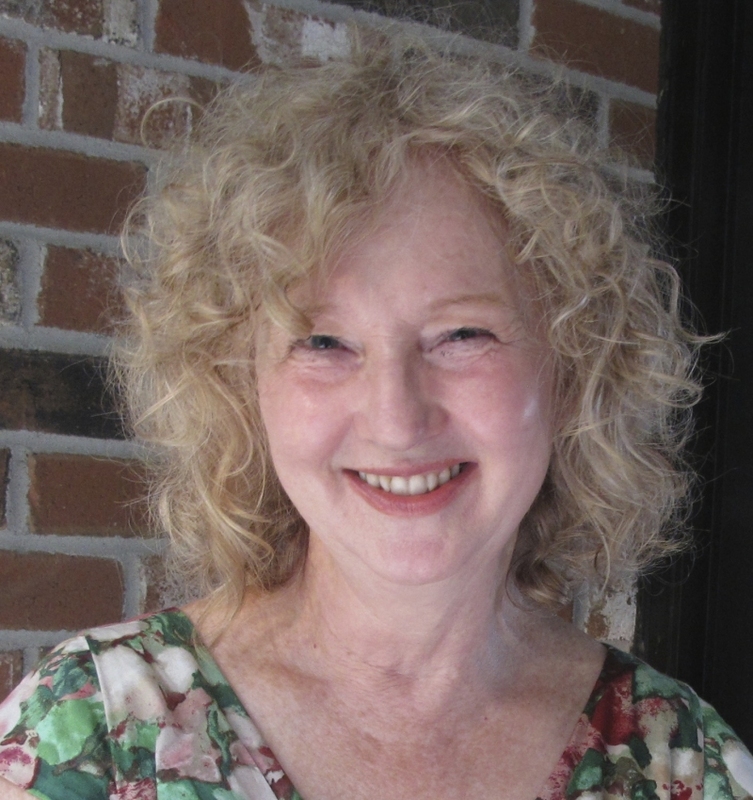 She works out of her studio in Quarry Point. From an early age, Heather was exposed to needlework and sewing in the form of sweaters, blouses and suits that her mother had made. Her interest in art was subsequently supported by an uncle who gave her art books. She graduated from university with a fine arts degree and took up teaching before exploring fibre art in a focused fashion. Heather initially sewed standard quilts in a grid pattern and then graduated to art quilts that integrated more elaborate patterns and images. She then abandoned the grid and started sewing quilts with organic shapes and integrated images. Using her own photographs as a guide, she experimented with textures of brick and stone before settling on her current cityscapes style. Heather has created a spacious, airy studio in her home on Hudson’s Quarry Point. She selects and hand-dyes cloth to suit the needs of the particular pieces she is working on. 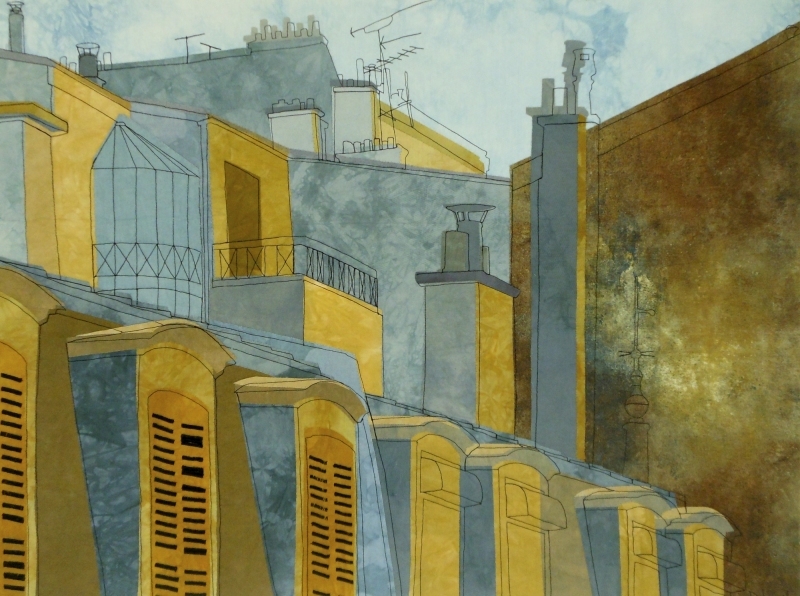 Recently she has branched out to using brighter colours and more reds and oranges in her work, while her earlier cityscapes had predominantly blue, yellow and earthen tones. While cloth and needlework are an integral part of her process, Heather has several paths she takes to a completed work. She typically starts with her own or someone else’s photographs. While she realizes the value of sketching scenes, a method used by many artists, she says that the photographs she uses have all the perspective and shape information that she needs and which are vital to her creations. Sometimes she draws the images she wants on her work piece and sometimes she works with shapes cut from cloth. Some works are essentially drawings made up of stitching on hand-dayed cloth. Others are made up of shapes of coloured cloth with stitcing superimposed, sometimes shifted from the outlines of the cloth, and giving definition to the work. Heather adds ink or paint to some works and some include patterned cloth. She works with colour, form and composition to explore the shapes, texture and sensuality of urban landscapes and their constituent walls, houses, towers and steel structures. Heather with one of her signature pieces. 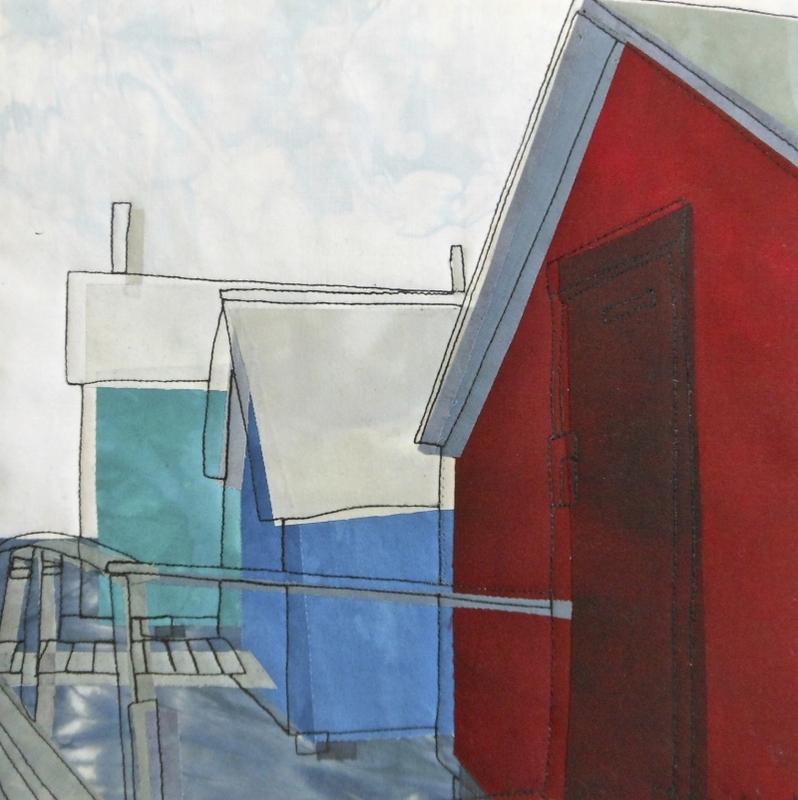 When she created this work, she still limited herself to colours that would not be out of place for buildings. She has now switched to “unexpected use of colour,” selecting bright oranges, yellows and reds not only for lights and windows, where they are not out of place, but also to highlight particular structures or shapes, as seen on the following pages. in addition to walls and buildings, Heather frequently includes antennas, railings or other steel structures in her works. They seem to add a kind of prickliness to the smooth stone walls and flat surfaces, a characteristic that is at odds with the soft cloth, but reinforced by the stitching. Heather calls this work Water Tower #2, using the tower as a focal point and contrast to the rest of the work. The yellow of the tower compliments the blue of the scene and is echoed in the windows and lights. The rest of the buildings are old stone structures from the last century and seem almost deserted. Is there an additional counterpoint between the orange tower containing the blue water that lends its colour to the buildings? Heather’s works gain some of their interest from such interplays of colour, structure and meanings. A solo exhibition by Heather Dubreuil. 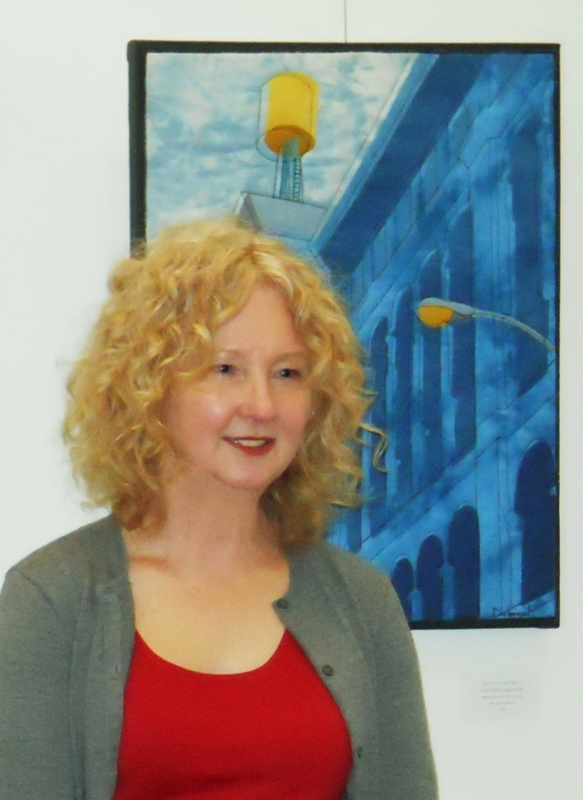 Meet the artist at our vernissage: SUNDAY JUNE 22nd from 1 p.m. to 3 p.m.
THURSDAY to SUNDAY noon to 4 p.m.
My cityscapes show the radiant transformation of an everyday exterior through the expressive potential of colour. I create sensuous, asthetic delight by a careful consideration of form and composition. I see my work in cloth and stitch as a contemporary expression of the culture of women's needlework. Intersecting lines and rhythmic patterns of shapes and colour are the chosen palette for artist Heather Dubreuil’s Cityscapes: Collages in Cloth and Stitch. The process of creating her pieces is intimate and involved as she often hand-dyes her cottons, which she then carefully cuts out into every needed shape. It is with this careful attention to detail as well as offering a unique perspective through the choice of her materials that Dubreuil’s contemporary stitch work gently nudges her viewer to take another look at the simple beauty of our modern industrial landscapes.